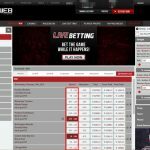 Wagerweb Review for 2019 - Can You Really Trust This Sportsbook? Going back more than 20 years, Wagerweb has a long and mostly positive history as an online sportsbook open to USA players. Although they often fly under the radar of larger sports betting sites, Wagerweb scores well across the board in my review. After betting there extensively, I found their strongest areas to be the number of sports and betting lines available, the flexibility to choose from several different bonuses, and one of the better live betting interfaces I’ve seen. Wagerweb has also clearly made an effort to work perfectly on mobile, something I think should be essential at every current sportsbook. Wagerweb reviews well for some of the most important factors of a US-facing sportsbook: competitive lines and excellent Bitcoin payouts. Wagerweb seems to understand the massive shift towards Bitcoin for US sports bettors, making Bitcoin payouts free and processed within 24 hours on any day of the week. Personally, I get payouts from them within hours. As online sports bettors, we can afford to be picky in this market. There are plenty of books, like Wagerweb, open to US players that all offer the same product. Sportsbooks need to be exceptional with payouts, offer competitive or reduced prices on lines, and cater to the burgeoning live betting market. Wagerweb checks those boxes, putting it on my short list of recommended sportsbooks. 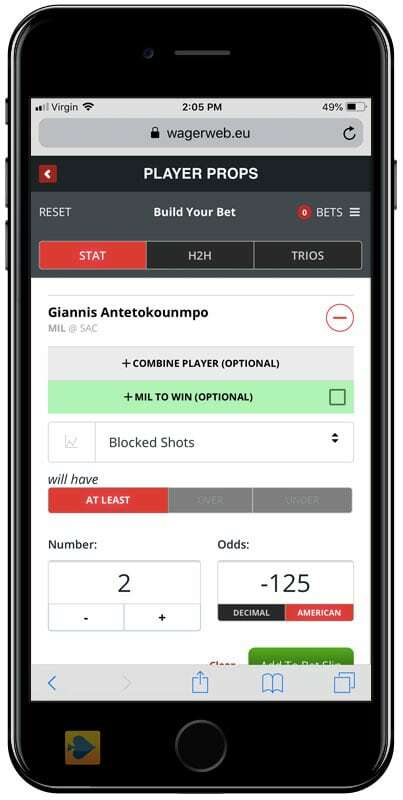 Wagerweb has one of the better mobile sports betting interfaces I’ve seen. 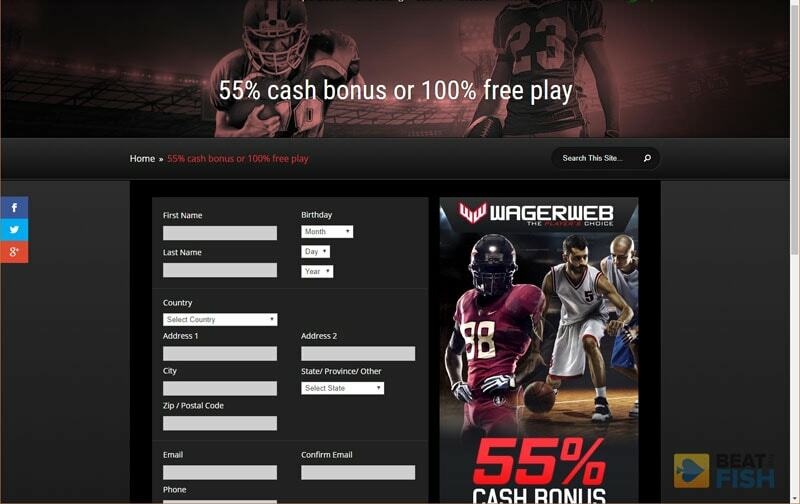 Wagerweb prominently advertises 3 bonuses, with the largest being a choice between 50% cash or a 75% Free Play bonus. However, I was able to find an unadvertised private offer for 55% cash or 100% Free Play. This is a private promotion that you won’t find at the main Wagerweb website. To get the larger bonus, you’ll need to sign up at Wagerweb using this landing page, which you’ll see if you click on link to them on this review. 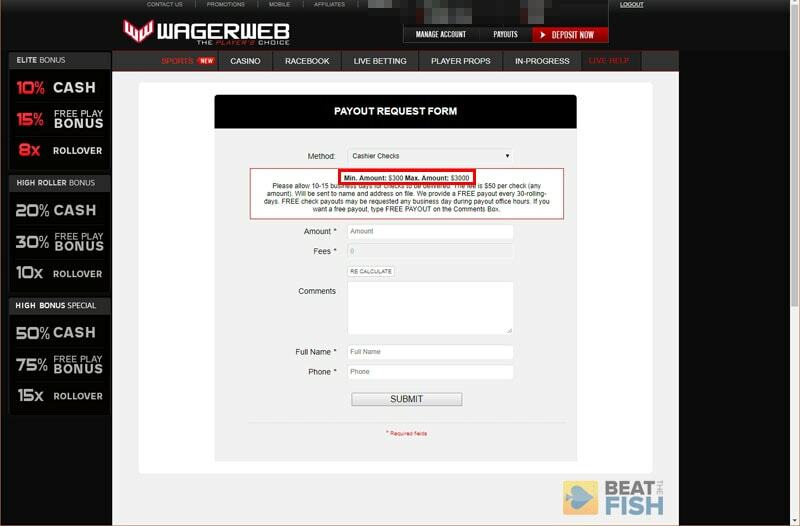 To be eligible, you’ll need to deposit at least $100 and ask for the bonus by contacting Wagerweb support. The rollover is 18x before you request a payout. This is the private landing page you’ll need to see at Wagerweb in order to receive the increased 55% cash or 100% free play bonus. I’m not always a huge fan of bonus promotions at sportsbooks, mainly because it ends up restricting your payouts in the form of a rollover. If you don’t like a sportsbook or find their line prices too high, you’ll probably want to take your money and run after a few bets. If you claimed a bonus, you can’t do that. Rollover means you have to bet your balance a certain number of times before you’re allowed to request a withdrawal. Wagerweb does have 3 bonus options, which is nice for flexibility. Each one has a different rollover amount, with the bigger bonus requiring a bigger rollover. Wagerweb lets new players choose how large of a promotional bonus they want depending on how much rollover is acceptable to them. I think the Elite bonus is the best deal, giving you 10% cash with an 8x rollover. That’s the lowest bonus rollover Wagerweb offers and there are no restrictions on betting. Although the bonus amount sounds modest, the real gem of Elite is the 1% cash back on sports bets, which is paid out in Free Plays every Monday. That essentially makes your lines -109 instead of -110, which can be huge if you’re betting for volume. The largest bonus at Wagerweb is just called the Welcome Bonus, which gives you 50% cash and has a 15x rollover. This does come at the expense of the 1% sports cash back, though, and you can’t wager more than 20% of your deposit on a single bet. 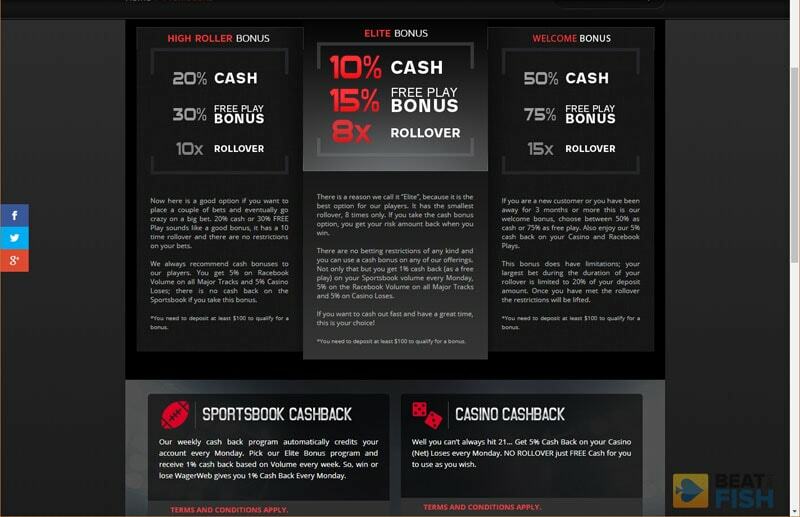 Finally, there’s the High Roller bonus, which is 20% cash with a 10x rollover and no restrictions on your bets. Those rollover numbers are about average for online sportsbooks. 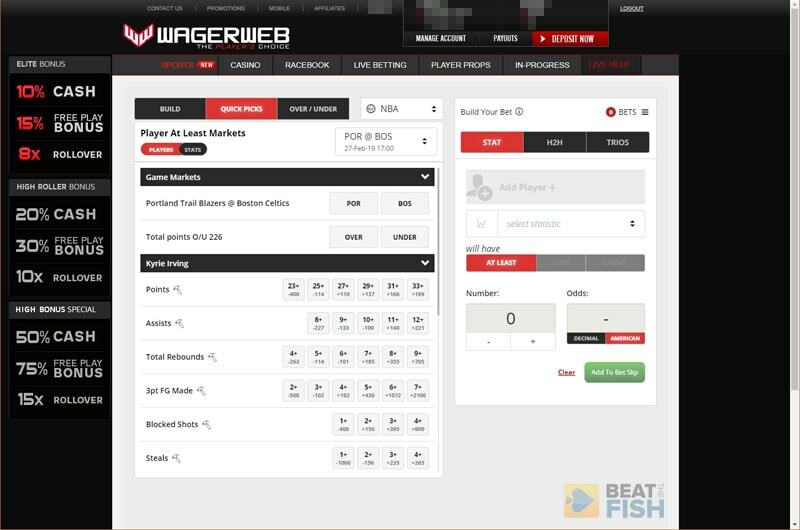 Wagerweb has one the better records systems, easily organizing all of your betting and banking history. I recommend you take the cash over the larger Free Play amount on all Wagerweb bonuses, since you can use it in any section and you get to keep the risk amount for bets. You do need to deposit at least $100 in order to get a bonus. Wagerweb has a minimum deposit of just $20, but you won’t get a bonus if you put in less than $100. Unless you claim the largest cash bonus, you’ll also get 5% cash back on all casino losses. I like the level of detail Wagerweb provides on each sports bet, even including the TV network a game aired on and the final score. If you want a bonus at Wagerweb, you’ll have to manually contact them through email, live chat, or telephone to request it. 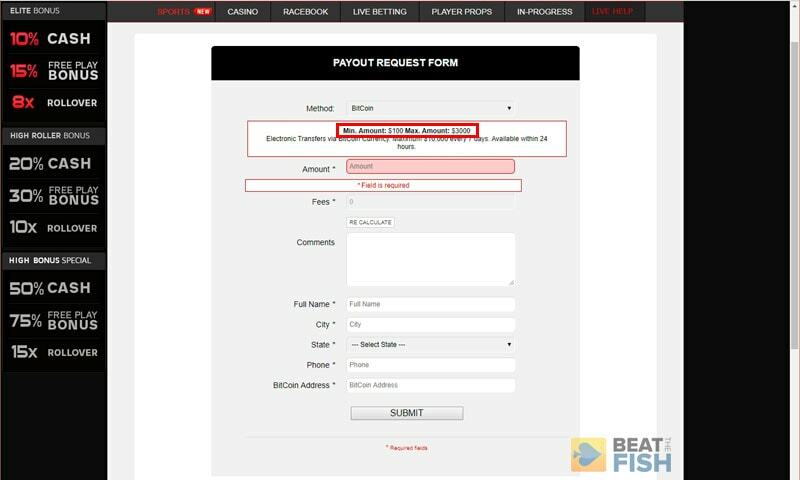 Be sure to let them know which bonus you’d like after you’ve made your deposit but before you start any betting. By default, Wagerweb doesn’t automatically award you a bonus when you deposit. I made 2 deposits at Wagerweb and was never prompted to select a promotion offer. However, the promo bonuses are plastered all over the website, so you’re certainly entitled to one if you don’t mind the rollover requirements. Keep in mind that you aren’t required to take a bonus if you don’t want to be locked in to restrictions on your payouts. As nice as bonuses are, that’s usually what I opt for at a new sportsbook so I’m free to do what I want with my money. If you don’t want to have restricted payouts, just deposit at Wagerweb and start playing. You aren’t awarded a bonus by default. Wagerweb has a huge number of sports to bet on. I can’t think of any league, obscure or not, that they don’t offer betting lines on. Wagerweb also has non-sports categories such as politics, entertainment, and esports. As for the actual betting lines, I find them nearly identical at Wagerweb to the consensus lines you’ll find from Vegas or other large online sportsbooks such as Bovada or BetOnline. The spread betting lines at Wagerweb are competitive with what you’ll find at other online sportsbooks, mostly sticking to -110 odds, but also a range from -105 to -115 for pro sports. Their lines are sourced from LinePros, which is a sports betting data aggregating company, so other books are using the same lines. Occasionally, you’ll see a half-point difference at Wagerweb than other sportsbooks, but they don’t seem to overreact to public betting. That’s what you want if you’re looking to get a particular favorable pick in before the line changes. 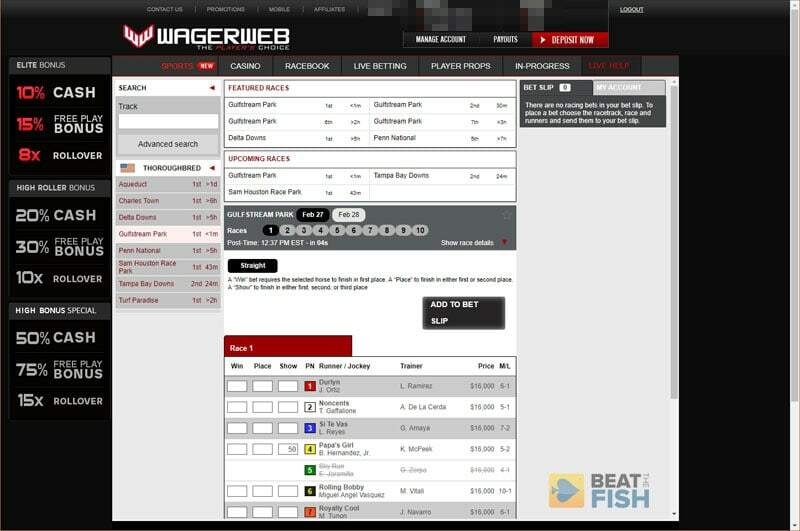 Wagerweb builds in an easy system right on your betslip for buying or selling points. Some sportsbooks either make this difficult or don’t even allow you to bet certain point ranges. As for line prices, Wagerweb mirrors what you’ll find at most sportsbooks. Around 80% of spread lines are the industry standard -110, meaning you’ll pay $110 to win $100. What’s interesting is that the rest of the straight spread lines can vary from as cheap as +100 all the way up to -120. It’s going to depend on which side you’re betting whether that’s a bargain or overpriced. You can also tell which side Wagerweb is seeing more bets on, as they’ll increase the price on that side and discount the other side in an attempt to even the action. Odds for professional sports leagues will usually stick between -105 and -115 at Wagerweb, where you’ll see the more extreme prices like +100 and -120 on college sports. Odds for (mostly) college sports can have a big 20% range, going from +100 all the way to -120. Also notice how Wagerweb offers lines on lots of partial-game bets, such as by quarter or even first 10 minutes for college basketball. Not every sportsbook does. I’ve also seen some great prices on live betting lines if you can get them quickly. For example, in live baseball, +150 odds on a -1.5 run line for the 2-run leading team in the 7th inning. 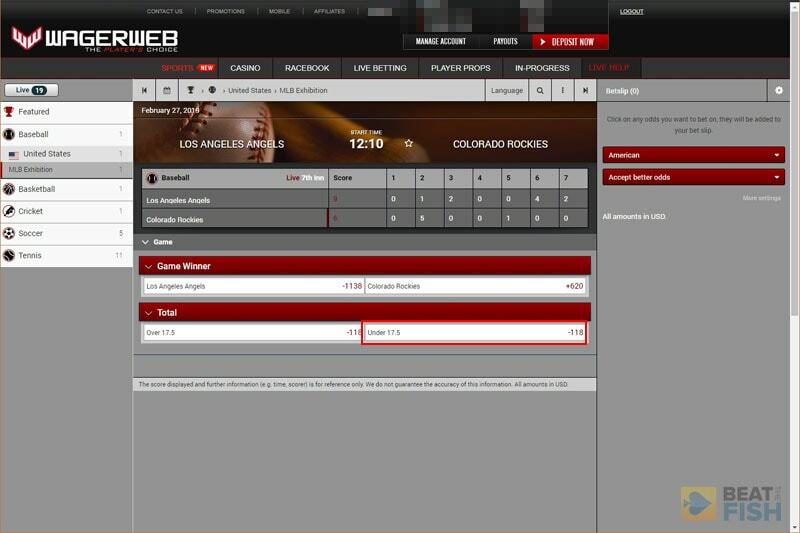 In general, Wagerweb has very good odds on baseball, sometimes 5-10% better than other online sportsbooks. One of Wagerweb’s biggest promotions is in their MLB odds, which I did find a bit better than many books. 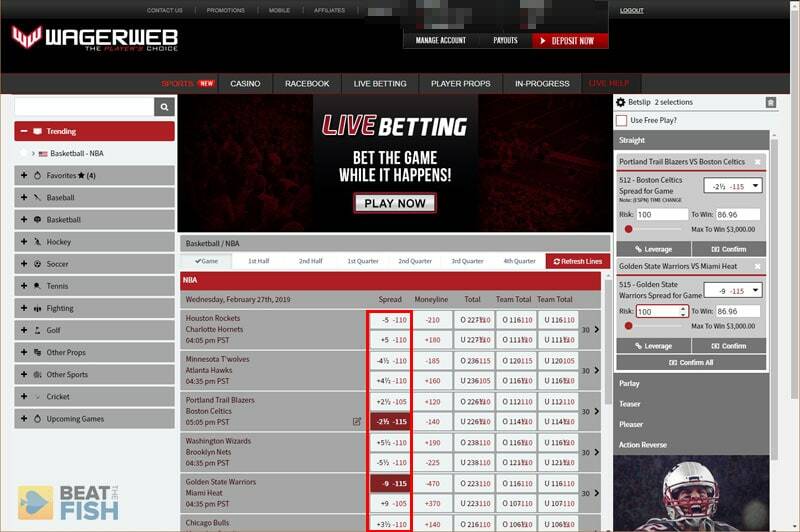 Wagerweb mentions live betting as one of the highlights of the sportsbook and I can see why. Unlike the live betting screens on some other sportsbooks that can really confuse me, Wagerweb seems straightforward and laid out well. You can easily expand or hide by sports and the available lines are easy to keep track of. Live betting is also perfectly formatted for the Wagerweb mobile site, which I think is essential. Live betting is most popular on mobile because those doing it are either at the game, realized a game started late when they’re out of the house, or are on the sofa watching it. I compared them, and Wagerweb usually had slightly better live betting odds than competing sportsbooks. Sharp bettors with patience can get in on some nice lines by betting live, such as baseball totals like this. Another test I like to do with sportsbooks is line up several of them on live betting to see how their lines compare. Wagerweb must source their live lines from a slightly different place or have them set for slightly better prices, as I found them to almost always have favorable live lines to other books. 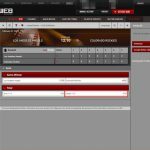 In-game live betting works smoothly and is easy to follow on the Wagerweb mobile site, which is probably where you’re going to be placing live bets. For sports bets, the Wagerweb mobile site layout is excellent. I’ve seen some sportsbooks still having trouble showing betting lines on mobile, either forcing you into turn your phone to landscape mode or just being difficult to manage. Wagerweb has clearly optimized for mobile, allowing you to see spread lines, money lines, and totals all on one screen. Wagerweb has a nice enough mobile site that I didn’t dread placing bets on it. You don’t have to turn your phone sideways and everything is easy to read. You can also either tap to add bets to your bet slip, or do a one click bet. Wagerweb lets you set the one click bet deafult amount to your choice, which is a nice touch. A minor gripe would be the lack of a bet search function on mobile, which is especially useful on a smaller screen. 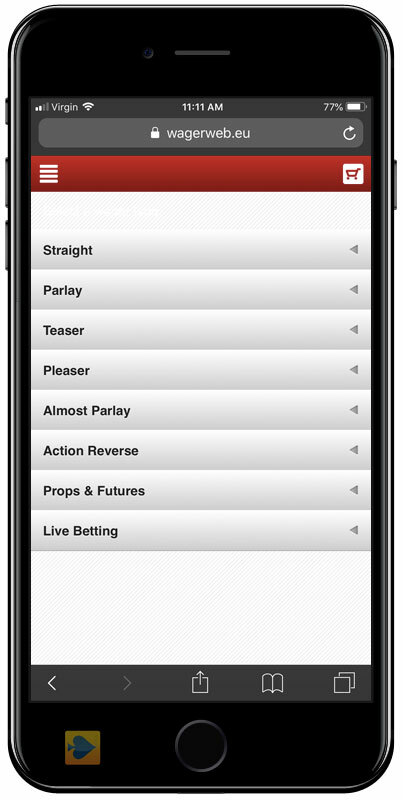 The player prop system, along with almost the entire Wagerweb betting catalog, is laid out perfectly for mobile. Also, for sports with a lot of games on the daily slate, such as college basketball, the games are split into multiple pages. It can be a chore to check 3 pages for the game you want to bet. 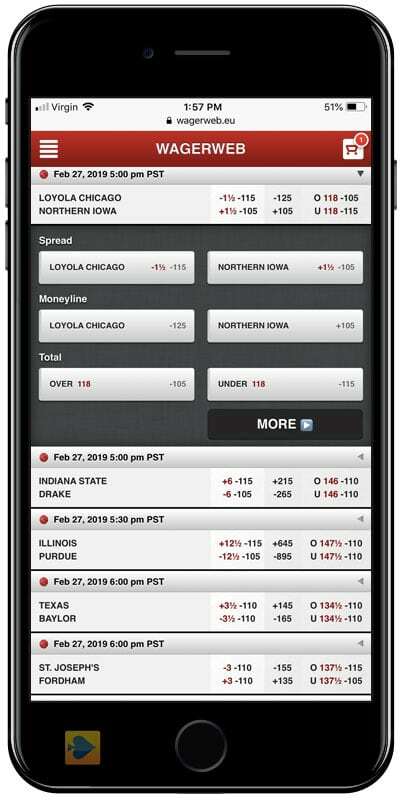 One thing I would like to see on Wagerweb mobile is a search function, as you’ll have to scroll through multiple pages on big game slates such as college basketball. The casino does work on mobile, but it isn’t perfect. 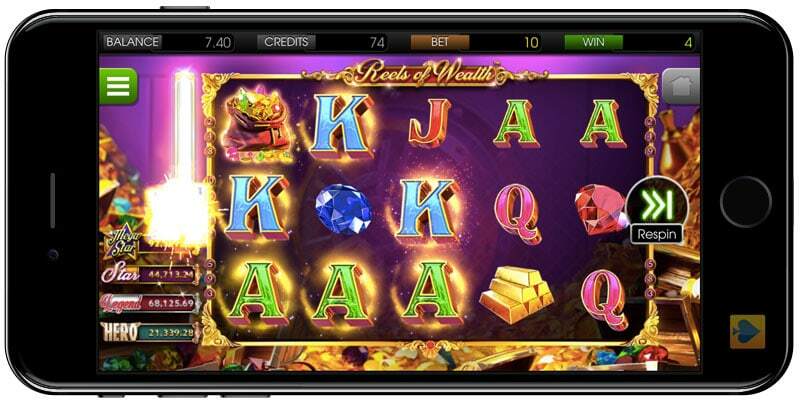 The Wagerweb mobile casino is a long unorganized list of some of its usual desktop casino games. Each one does load and work, but there can sometimes be formatting glitches where half the game is off the screen. 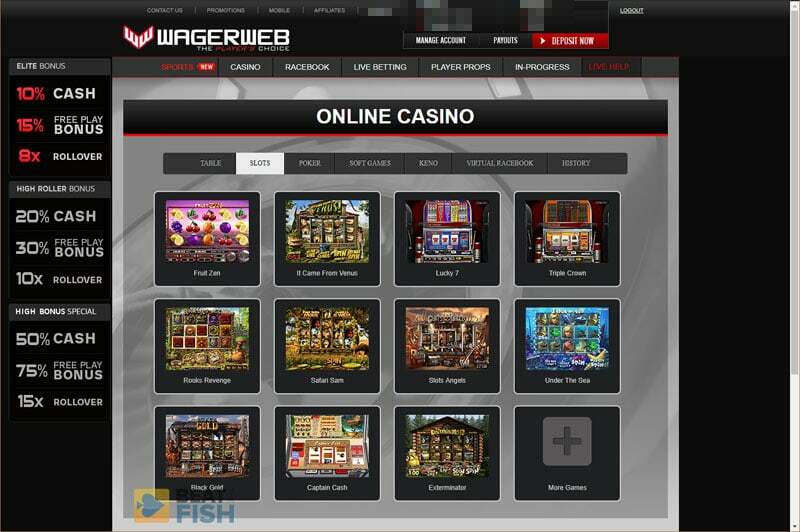 Some parts of the Wagerweb mobile casino work very nicely, such as this slot, whereas others are a bit of a mess. 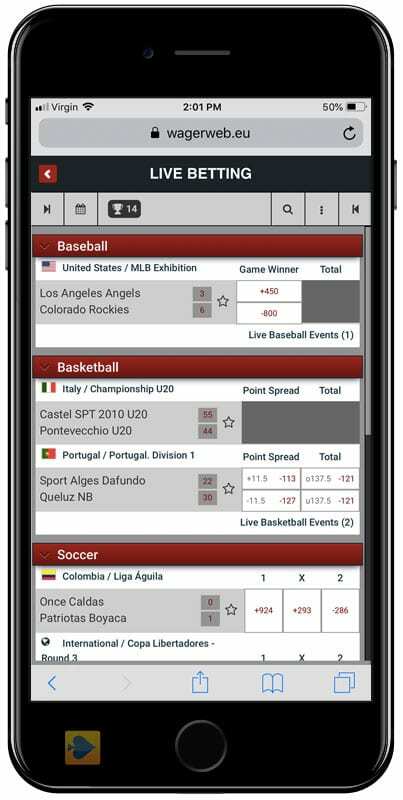 The easy live betting interface stays easy and quick to load on Wagerweb mobile, which is probably where you’ll be doing most of your live betting anyway. 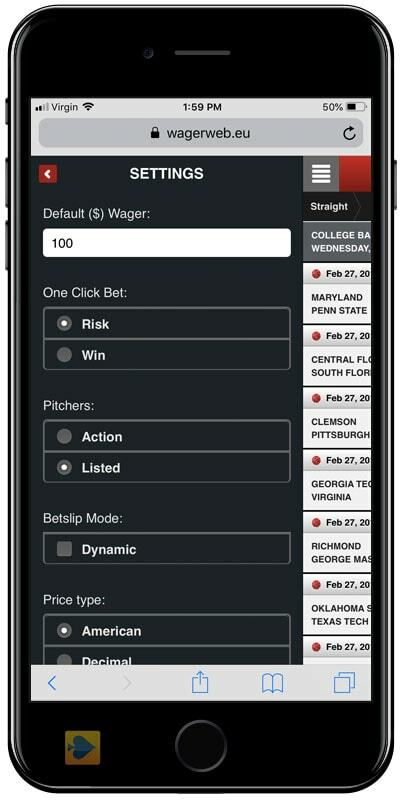 On mobile, Wagerweb has a nice system for One Click Betting, allowing you to set a default bet and skip the bet slip. 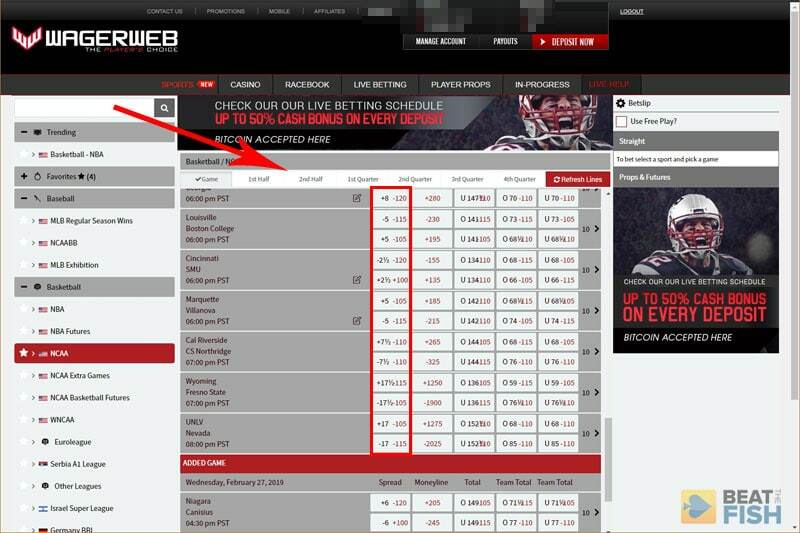 Wagerweb has the most robust and easiest to understand player prop system I’ve seen on any sportsbook. I know there are a lot of prop specialists out there who would love this interface. Besides every player prop you can think of for games, what’s unique at Wagerweb is you can see the odds for adjusting every prop. The Wagerweb prop system is excellent, allowing bettors to see the odds for changing each stat. Not every sportsbook even allows you to change props at all. What’s also cool is you can even just build your own random prop for just about any player in all the usual prop stats. I’ve seen a lot of sportsbooks missing a lot of players or specific props. With Wagerweb, that isn’t going to happen. 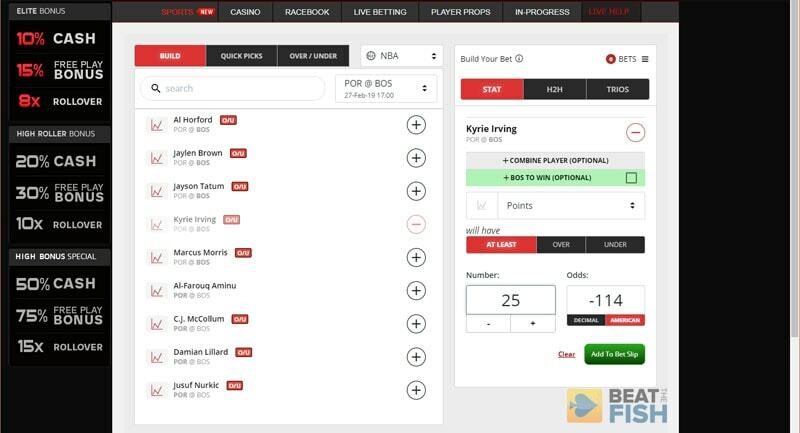 You can build any custom player prop at Wagerweb by picking almost any player in a game and then choosing the stat you want to bet on. Although I don’t pretend to know enough about betting on horse racing to give a detailed analysis, the Wagerweb racebook section seems to have a solid interface. If even a racebook noob like myself can understand enough to place a bet, then I imagine it would be cake for pros. The Wagerweb racebook is easy to understand, with a grid layout and a schedule of upcoming races. Unfortunately, a subpar website seems like a prerequisite for a lot of the better US sportsbooks. Wagerweb is no exception, down to last year’s date in the copyright footer. I would like to see them add more information on the essentials for prospective players, such as their current lines and more of the fine print details on their promotions. One you’re logged in, the interface works well, but I still feel like the entire Wagerweb site could do with a fresh coat of paint. One important note for new players is that you should be sure to use your correct phone number when you sign up. 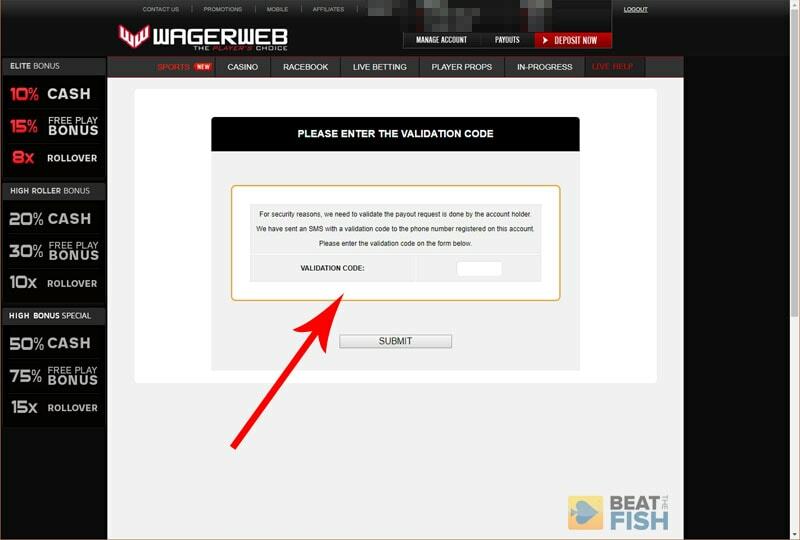 As is now common at a lot of sportsbooks, Wagerweb verifies your number before they let you finalize your account. They’ll call you with an automated code to insert at the site right after you sign up. You’ll have to validate your real phone number when you sign up at Wagerweb, which shows its value when you have to use it to confirm you’re the one requesting a payout. For security, I’m glad that Wagerweb makes you log in with an account number rather than just an email address. That way, even though you know I have a Wagerweb account and my email address, you don’t know my account number to even try to hack it. Most of all, I really appreciate that Wagerweb makes you verify your withdrawals by sending a text message with a code to insert. Someone is going to need physical access to your phone in order to approve a payout. All of Wagerweb’s deposit methods are geared towards USA bettors, with Bitcoin naturally being the best choice. Those last 2 options, which will only be used by a fraction of players, will require you calling in or opening Live Chat to get the details as they aren’t built in to the cashier. For credit card deposits, Wagerweb has a low minimum of $20 and a maximum of $500. Although everyone has access to a credit card, I never recommend using it over Bitcoin. Wagerweb will eventually require you to fill out a credit card authorization form before you receive any withdrawals. Even though Wagerweb supports some rarer deposit methods such as bank wire or cash transfer, they’ll still try to steer you towards Bitcoin or credit card. Most importantly, although Wagerweb can process most credit cards successfully, some banks will decline the transaction and possibly lock your card until they speak with you. That’s an awkward conversation you’d rather not have. Also, the $500 maximum credit card deposit won’t be enough for serious sports bettors. Serious online sports bettors, casino players, and poker players have already discovered the gem that is Bitcoin for all deposits and withdrawals. It’s private for players, it has low minimums, and you’ll always get the fastest payouts. Wagerweb builds Bitcoin into the cashier, has a $25 minimum Bitcoin deposit with a $10,000 maximum. 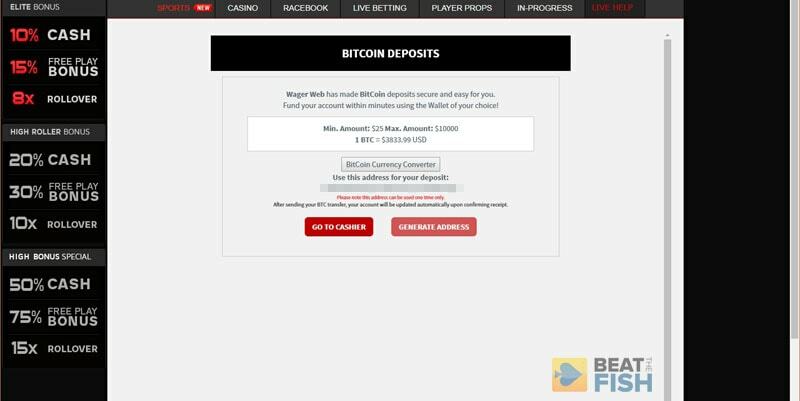 Although Wagerweb has a clunkier Bitcoin deposit system than others, it works. Instead of asking how much you’d like to deposit and giving you an exact amount of BTC to send, Wagerweb just gives you a Bitcoin address to it to. No QR code or anything flashy about it. Wagerweb has a simpler Bitcoin deposit interface than most, lacking a QR code or live updates on your deposit status. Like many sportsbooks, after you send the Bitcoin to Wagerweb from your wallet, there’s no confirmation that they’ve received it and it’s just awaiting confirmation. 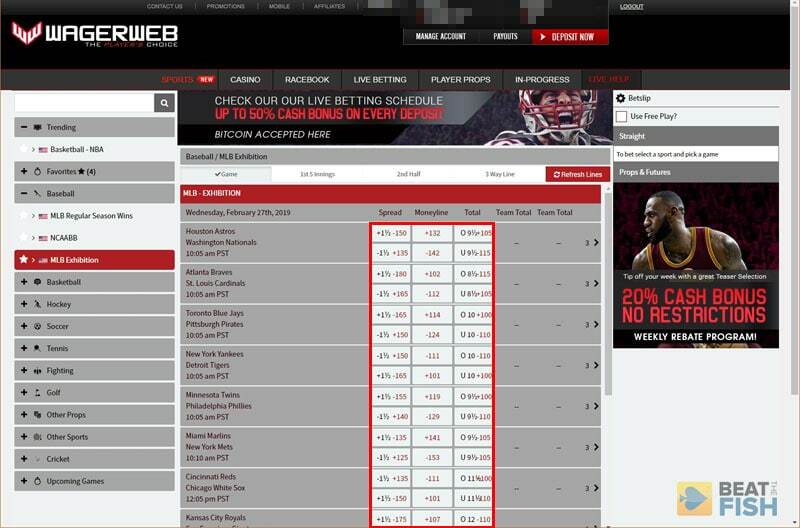 However, Wagerweb is one of the only sportsbooks that credits your Bitcoin almost immediately. Almost every other online gambling site I’ve played at waits to credit your balance until it’s fully confirmed 6+ times on the Bitcoin network. That can take 15-30 minutes. Admit it – you compulsively refresh your cashier while you wait for that, too. 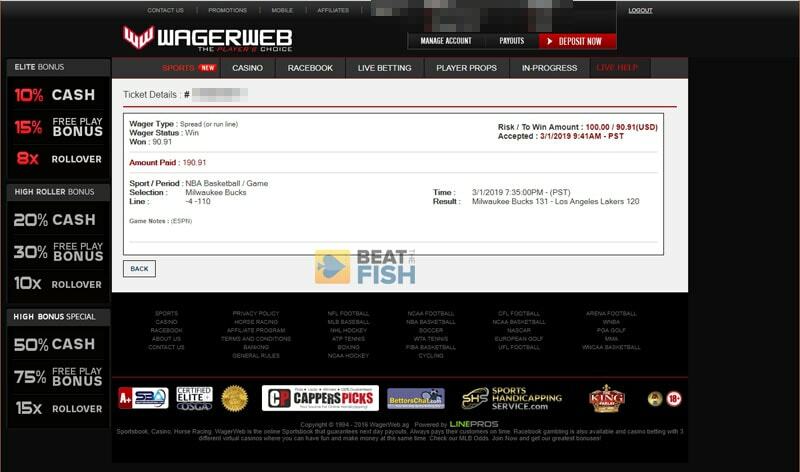 Wagerweb credited me as soon as I sent it, which earns them big props from me. That’s an unnecessary risk taken by them that puts trust in the player. Keep in mind that if you want to have access to 24/7 free Bitcoin payouts at Wagerweb, you’ll need to deposit exclusively with Bitcoin. 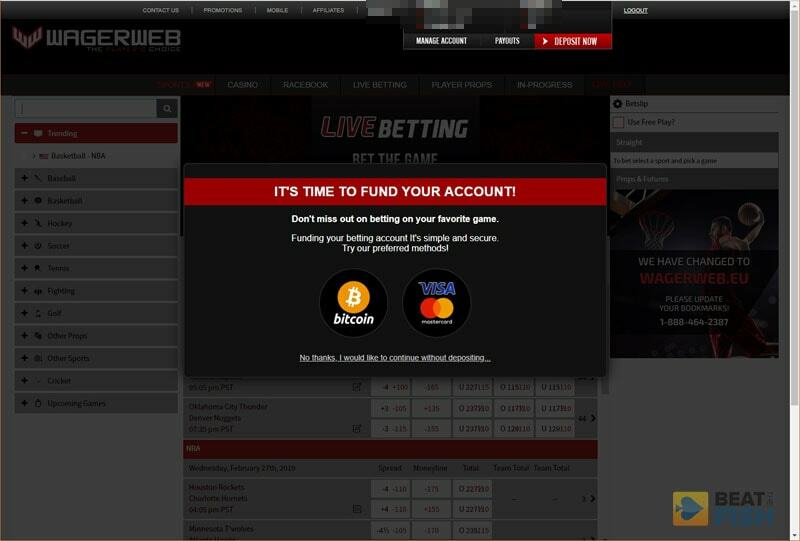 Wagerweb is one of the only online sportsbooks to credit your Bitcoin deposit before it’s fully confirmed yet. My Bitcoin deposit showed up as a usable balance within 5 minutes, which is an excellent perk. 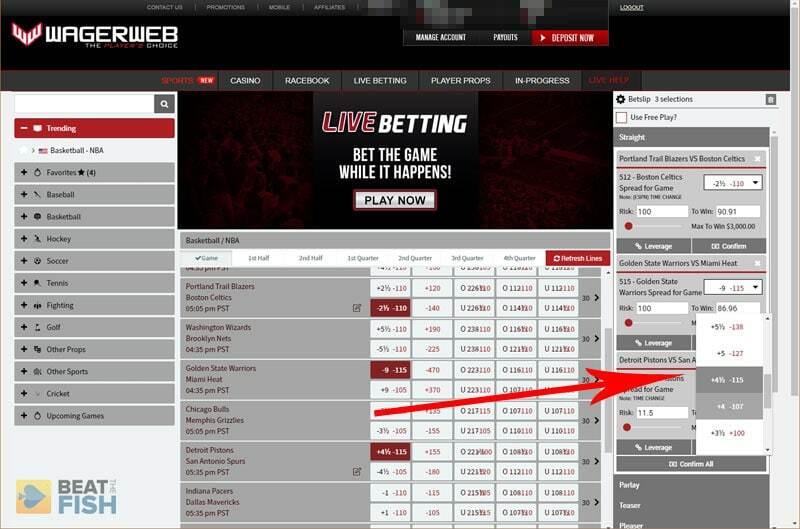 When it comes to online sportsbooks, the bottom line for regular bettors is probably going to be how cheap the lines are and how reliably you can get payouts. I appreciate that Wagerweb highlights their payout strength, guaranteeing next-day payouts if you use Bitcoin. I don’t have to wait anything close to next-day for my Bitcoin payouts, however. Wagerweb sends my Bitcoin withdrawals within 90 minutes, which sets a record as the fastest I’ve ever gotten one from any gaming site. I can’t overstate how good it feels to get a payout that quickly. 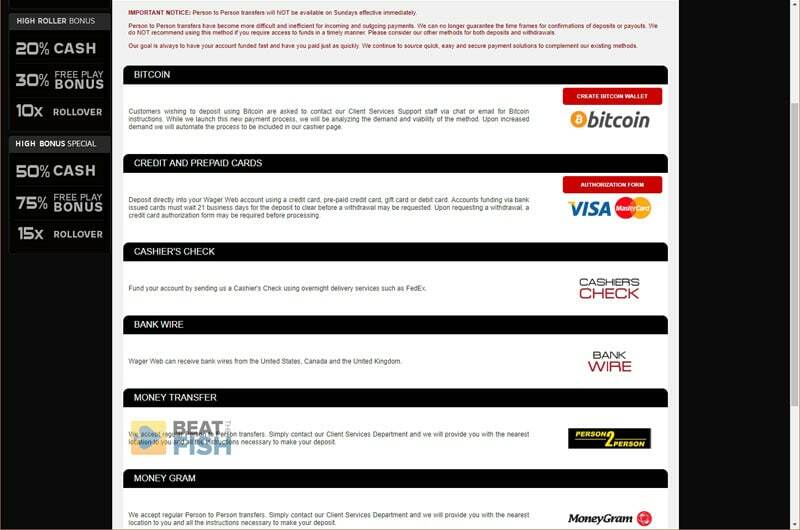 Wagerweb has a very simple cashier for withdrawals, offering only cashier’s check or Bitcoin. Those methods are likely going to satisfy 95+% of players. The minimum for cashier’s check payouts at Wagerweb is high at $300, which is another reason to just use Bitcoin. Cashier’s checks will arrive at your physical address within about 2-3 weeks and have a $300 minimum. That minimum is higher than I would like, but it accentuates that I think every online gambler should be using Bitcoin at this point. I do find it obnoxious when sportsbooks allow you to deposit less than you can withdraw, but that’s common practice at all online gaming sites. Bitcoin payouts are where Wagerweb shines. They beat a lot of larger sportsbooks by allowing you to make a Bitcoin withdrawal 24/7. Ridiculously, a lot of books actually restrict Bitcoin (and sometimes other methods) payouts to specific days and times. The minimum for Bitcoin withdrawals at Wagerweb is $100 with a maximum of $3,000 per day and $10,000 per week. A vast majority of players aren’t going to come close to that, but it’s something larger bettors should keep in mind. 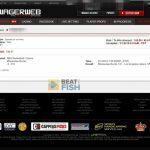 Wagerweb surprised me by setting my personal record for fastest Bitcoin payouts by any online gaming site. I get my payouts from them in as little as 90 minutes. Another aspect I give Wagerweb props for is that you never have to pay withdrawal fees if you do it strategically. Although the usual check fee is $50, you can get a free cashier’s check payout every 30 days. Just be sure you type FREE PAYOUT in the comments field, which is a strange hoop to have to jump through, but certainly worth it. Bitcoin payouts are always free so long as you only deposit via Bitcoin. 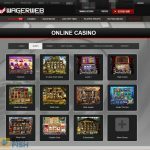 Although I doubt players are going to be joining Wagerweb for the casino, they actually have quite a large number of games. Casino games are developed by Betsoft, who is a veteran for sportsbook casino games. Although it might be an afterthought to sports bettors, the casino is pretty robust with a large number of slots. There are around 25 tables games, 25 video poker variations, 50 slots, Keno, scratch cards, and virtual horse racing. The Wagerweb casino game graphics are around the middle of the pack, neither as painfully basic as some sportsbooks nor as flashy as some dedicated casinos. 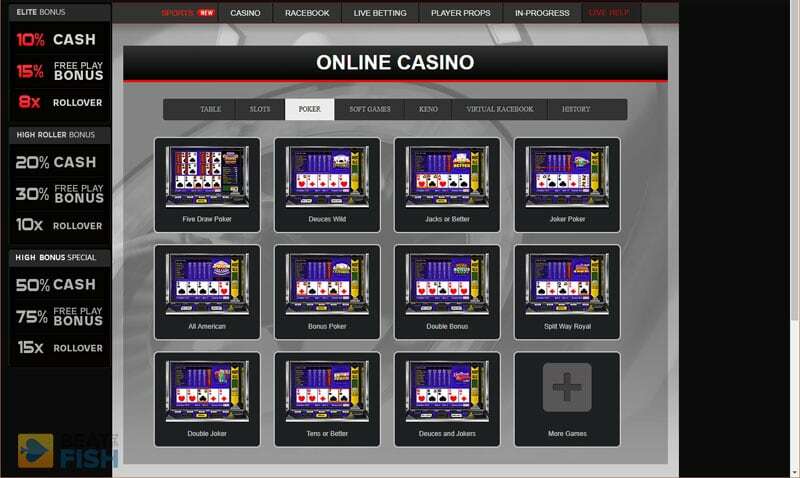 Video poker is another large section in the Wagerweb casino, with a number of different variations. One positive of the Wagerweb casino is you can play casino games without first transferring money over from your sportsbook balance. That has irritated me at other sportsbooks in the past. You do still have to make transfers for the live casino. 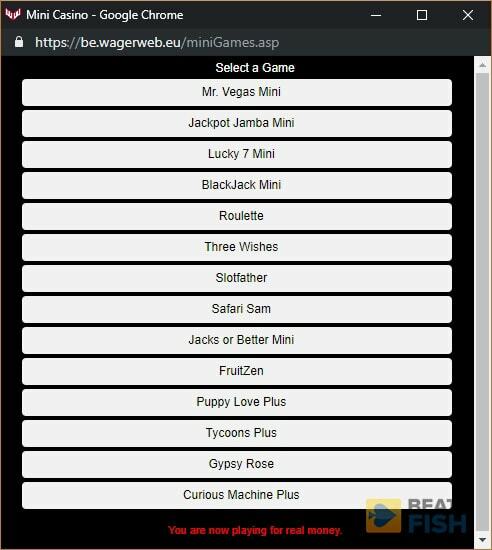 The Mini Casino Games section feels pointless to me, essentially offering a small selection of the main Wagerweb casino offerings in a miniature browser window. If you try to resize it, you just distort the graphics. Stick to the normal casino section. I can’t stand the “mini casino”, which is a cluttered list of games in a window small enough to make the games illegible. I’m surprised that Wagerweb has a live dealer section in their casino, as it can be tough to find game providers willing to offer that to US-friendly sportsbooks. Wagerweb has live Blackjack, Roulette, Super 6, and Baccarat with 2 or 3 tables of going around the clock. 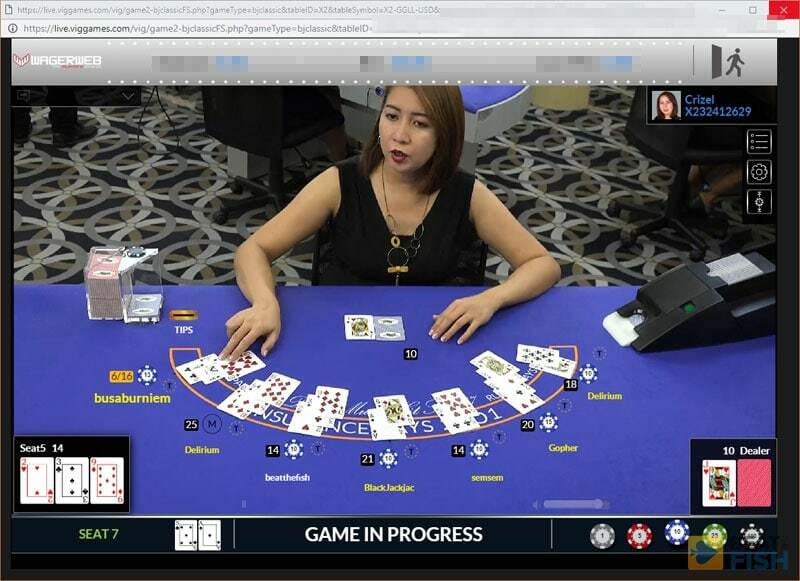 You can see a preview of who the live dealer is and how many seats are open. I was really surprised that Wagerweb offered a live dealer casino, which is fairly rare in the US casino market. You can preview the dealers before you sit down. Keep in mind for Blackjack, however, that the tables will often fill up due to the limited number of live dealers at Wagerweb. There is also a $10 minimum bet for live Blackjack, higher than the $1 minimum on the other games. As a player used to old-school casino games, it takes some getting used to waiting on a dealer and other players. That’s part of the charm and casino experience, though, if you’re playing with live dealers. Allow Flash to run and live dealer tables work very well. Here, I’m at a full Blackjack table, which happens frequently at Wagerweb. 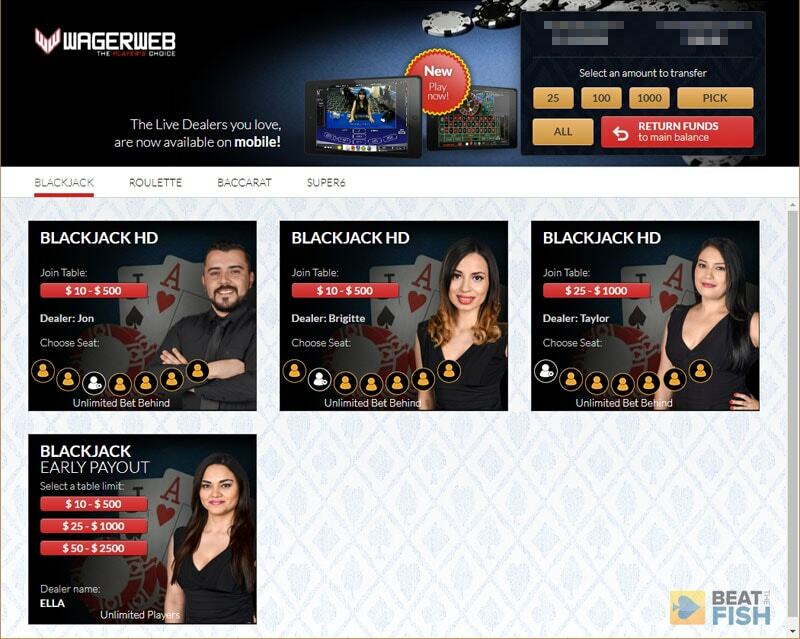 The biggest problem with the Wagerweb live dealers is that the whole system goes down, sometimes for several days. You’ll see a simple “Contact Customer Service” text message where the live dealer lobby should be. I’d rather see Wagerweb just take down the live dealer section entirely rather than offer a half-functioning product. Wagerweb is unique in that they really encourage telephone support for players. The have 6-8 different toll-free phone numbers dedicated to new accounts, banking issues, and placing wagers. Live Chat is also easy to see in the main navigation menu. I asked Live Chat some specific bonus questions, which usually stymies outsourced support reps. This one seemed to get it. One of the benefits of smaller sportsbooks like Wagerweb is often better support. 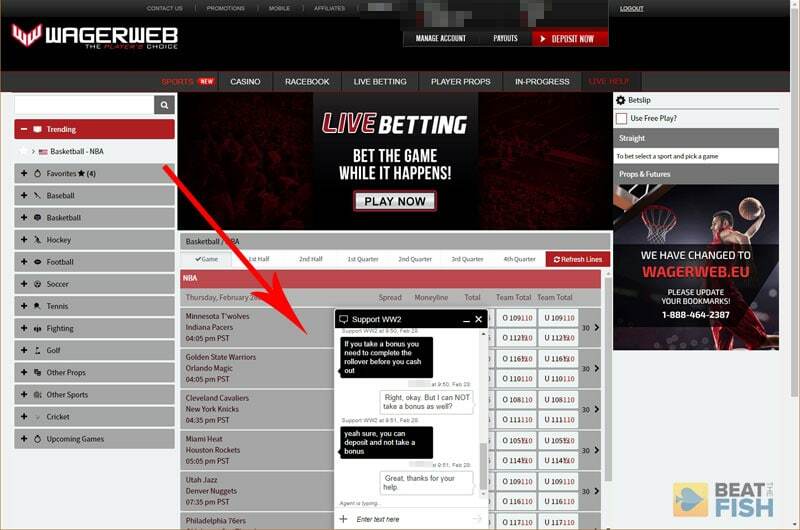 Wagerweb seems to have one of the better player support systems, integrating live chat into every window and reps that seem to understand the sportsbook. 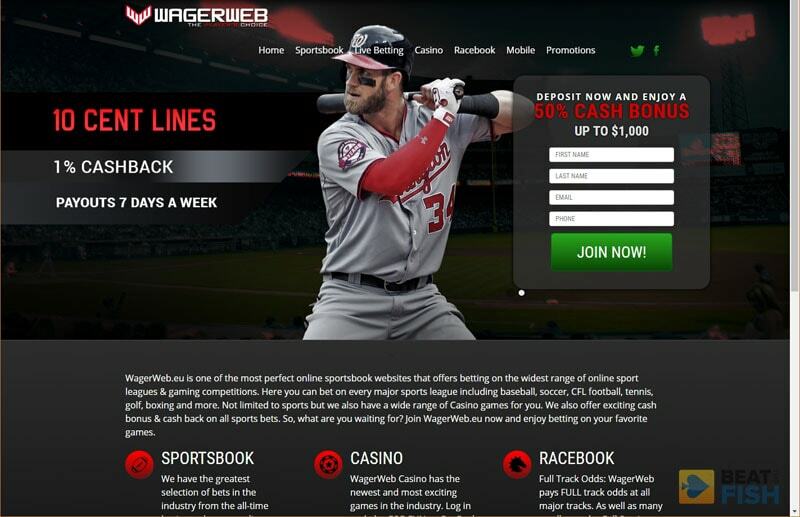 Wagerweb is one of my highest-scoring online sportsbooks open to USA players due to its strength in key areas like payout speed, live betting, and an excellent mobile interface. It’s tough to find an event they don’t offers odds on and their player prop interface is unmatched. I appreciate their guarantee of free next-day Bitcoin payouts and the hidden gem of making Bitcoin deposits available for betting as soon as you send it. Although I’d like to see a promotion for more discounted odds, the Wagerweb lines are in line with other books. Some of their live betting odds do beat larger books. If you’re from the US, Wagerweb is an easy recommend as one of the top handful of online sportsbooks in the market.